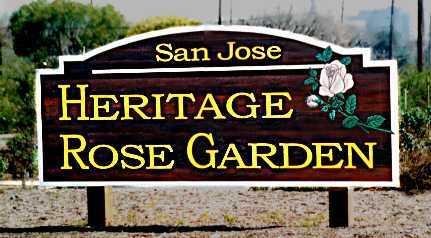 The San Jose Heritage Rose Garden is maintained completely by volunteer efforts. There are many different tasks available from weeding, clipping spent blooms and winter pruning to propagating and planting added varieties. Volunteer garden supervisors will provide training, as necessary. For information on volunteering in the Heritage or other areas of Guadalupe River Park Conservancy, contact Guadalupe River Park Conservancy's Volunteer Coordinator by email or at 408-298-7657. Regular volunteer workdays at the garden, weather permitting are on Wednesday and Saturday, from 8:30 to 11:30 am. Wednesday sessions are sometimes followed by snacks. Bring a hat and drinking water. We'll supply bypass hand shears and gloves. Gather by the nursery and shed. You will find us getting tools from the tool shed. You may park in the parking lot on Seymour Street. Pruning. Once-bloomer pruning is accomplished in July and early August. Winter pruning starts with Tea roses in November and continues with modern roses through the middle or end of February. Public pruning lessons are given starting in early January and continue through February. Lessons start promptly at 8:30 AM and continue until 11:30 AM. We cannot accommodate late arrivals. This page was last updated on 06/14/2017.